Public entry for my parents, again. I was on Live Journal in the US, in Michigan, actually, and someone posted in my Snape Daily community that Alan Rickman was making a semi-rare public appearance at the Every Man Theater in London on September 5. He made a movie called Snowcake, somewhat of an art film, that they are having trouble selling to distributors. So they decided to do a charity showing at the Every Man, where people would pay (quite a lot) to come see it, and the the producer, director, and star (Alan Rickman) would do a question-and-answer panel afterwards. Since that date was during my then-upcoming study abroad semester in London, I reserved my tickets immediately! However, I got a call in the middle of the night the next day telling me that the tickets were already sold out. I was terribly bummed, but decided that once I was in London, I would head down there at the proper time and see what I could do. Cut to September 5, in London. I called during the day, and they said that I should come about half an hour early to see if they had any returned tickets. I got excited and ended up leaving 4 hours early ^_^; I took the Underground up to Hampstead (about an hour ride), and on the way there realized I had forgotten my digital camera. I bought a disposable at the tube station (for 12 dollars, sniffle), and headed over to the theater. I got there about 3 hours early, and lucky for that, because they DID have a returned ticket. One. IN THE MIDDLE OF THE FRONT ROW. I almost died. Instead, I bought the ticket and walked around Hampstead until showtime. After sitting for a bit, I heard some people talking at the reception desk. Then I head it...His Voice. "Thank you, I'm Alan." I risked a look, and there he was, Alan Rickman. Standing only ten feet away from me. I averted my eyes. I didn't want to be the giddy fangirl. I studied my programme with interest, probably too much interest, and strained to hear his voice again. I saw him take a peek into our room, and his eyes brush over me, but I steadfastly refused to look up and give a dopey smile. I ignored him. Eventually he left, and the other women in the room and I looked at each other and giggled with excitement. I continued to study my programme, and apparently I looked lonely, because a group of people invited me to come over and talk to them. They turned out to be an artsy indie theater group, and they talked and talked of Little Miss Sunshine and all of the current popular art films. I didn't have anything intelligent to say, so I kept mostly quiet, unless people asked me about my "accent" (squee! ), and then I was able to fancily admit that I was studying abroad. I think I pulled off the "fancy art person" pretty well. I don't think any of them guessed that I was mostly there for Alan Rickman ^_~ It was a LOT of fun to sit and talk with them. What a different kind of experience. After that...they ushered us in! They briefly introduced Alan Rickman and company before the movie, and then they went back to their seats in the corner and we all prepared to watch Snowcake. It was surprisingly good. I assumed that if they were having trouble selling it, it must be pretty crappy - but I was wrong! I liked it a lot, actually. It was about a man who just got out of jail (Alan Rickman), who picks up a hitchhiker, but then gets in a car accident that wasn't his fault and the hitchhiker dies. Full of guilt, he looks up her family to apologize to them, but it turns out she lives only with her mother, who is autistic and incapable of taking care of herself (Sigourney Weaver). He feels even worse, and decides to stay with the autistic woman until her parents can come (they're unreachable on vacation at the time). They all learn to enjoy the moment and to enjoy the beauty of simplicity, Alan's wounds are somewhat healed, and everybody is ready to move on with their lives. There is all sorts of metaphors about snowglobes and snow and what not...*sigh* you'd really have to see it. It was quite beautiful. After that, the question-and-answer panel. I was sitting about five feet away from the stage with Alan Rickman on it. It was SO hard not to squeal "SNAPE! SNAPE! HARRY POTTER!" As some of you know, I seem to have "Harry Potter Turrets Syndrome", and it was difficult to restrain myself. I tried to look interested and intelligent and keep the fangirl inside. Alan's shoes were beautiful, I remember that much. And he looked nice - not all blotchy and old like the picture seems to indicate. I thought he looked pretty good. After everything was over, people filed into the hall. I clutched my bag, with my disposable camera and the picture Brittany drew me, hoping Alan would be in the hall giving autographs. And he was! He looked clearly tired, like he wanted to go home. I felt kind of bad and fangirl-ish asking for an autograph, but...I knew I would regret it forever if I didn't. How strange that I had to ruin my 30 seconds with Alan Rickman with typical fangirl things, just to preserve the memory of the ruined moment in the future. Oh well. He gave a little "hmm" of surprise that was SO Snape when I handed him Brittany's picture to sign. It was a recognition that I actually was a Snape fangirl and not an artsy intelligent person like everyone else who had come to see the film. I loved that sound. I felt like I had just given him a less than satisfactory potion, and he was "hmm"-ing in disapproval. It was so cool. He signed it quickly, and all my carefully constructed thoughts of beautiful intelligent things to say faded quickly. I squeaked out, "Truly Madly Deeply is one of my favorite movies, thank you so much for making it", and he may have said something, but honestly I can't really remember. I remember him handing me the drawing back, now signed, and smiling at me. I remember having the random irrational thought, "I wish he had scowled and raised his eyebrow rather than smiling." I sat down on one of the velvet couches in the room while he was surrounded by more people. I tried to get the drawing back into it's clear pouch, but my hands were shaking so much that I found it quite difficult. I changed positions to support my arm with my leg, and then my leg started twitching. I was sweating quite a lot. It took me a full minute to get the picture back in the clear pouch and safely inserted into my folder. I didn't really care though, because that was just more time I had to be in the same room with Alan Rickman. I suddenly remembered my camera. Shoot! Any hopes of being beautiful and mysterious would fade if I had to get back in line and ask him for something else. I was shamed, but I just NEEDED a picture. He was clearly even more tired, and wanted to leave, but I stopped him quickly and said, "I'm sorry, may I have a picture with you as well?" Again, he may have said something, but I'm not really clear on it. I handed my camera to a stranger, she snapped it quickly, and I said, "Thank you so much" to Alan, and then stepped in to another room. Now shamed and embarrassed and fully revealed as a fangirl, I decided to make my exit, rather than standing around in the room gawking at him. I literally ran down the stairs and in to the streets. As I headed for the Underground, I no longer could restrain my Harry Potter Turrets - as soon as I knew Alan couldn't hear, I screamed "SNAPE! SNAPE! HARRY POTTER! OH MY GOSH! SNAPE!" Some strangers on the street glared and me, but I didn't even care. I started running, and ran all the way to the subway, grinning like a fool. I didn't even care. 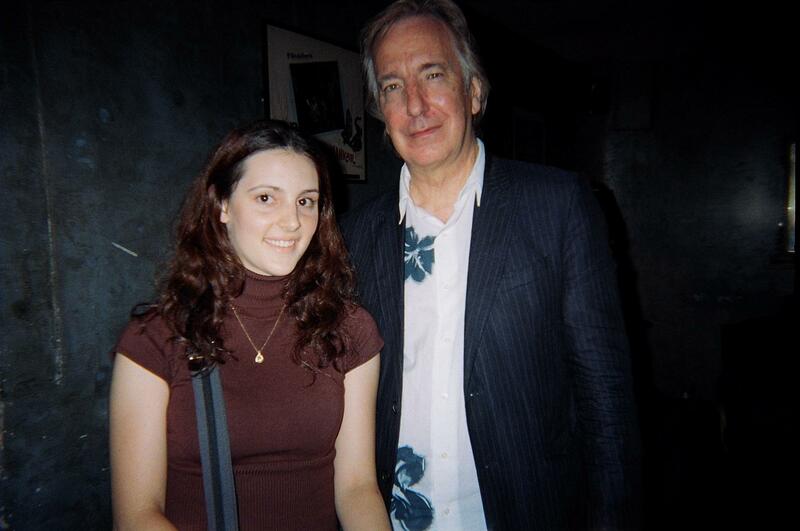 I had just met Alan Rickman, and he "hmmed" at me, and smiled at me, and let me take a picture with him. Holy homunculus....that is literally the best thing ever. HOLY CRAP!!! THAT"S AWESOME!! ZOMG!!! YOUR LIFE DREAM HAS BEEN FULFILLED!! Hello, sorry that you don't know me, but I just wanted to say thanks for sharing that wonderful story! And congratulations on meeting him! Just a teeny, tiny correction -- Linda, the autistic woman in the movie is played by Sigourney Weaver. Yes, lol, someone corrected me on an entry that I cross-posted to my Alan Rickman community, but I forgot to correct it here. I don't know why I get those two actresses mixed up. Thank you! WAAAAAAAAAAAAAAAAAAAAH!!! Congrats Courtney!! You met freakin' ALAN RICKMAN!!! ONE FREAKIN' ticket - front and CENTER. What are the chances!? I'm so glad you met him Courtney! EEE~!!! Holy hell, that is awsome!! Jealous, jealous, JEALOUS!! Are you kidding?? Are you KIDDING ME??? "I'm Courtney and I'm going to go to London and find Alan Rickman." I had to double take on that pic. I was like "old man yeah su---OMGWTFBBQSNAAAAAAAAPE"